Heat dutch oven (or skillet) over 375 degree coals for Frying. Combine hamburger, onion, and pepper over heat. 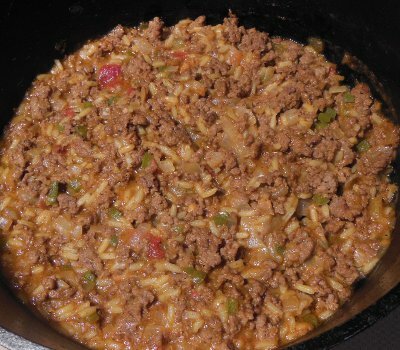 Stir and chop hamburger until meat is crumbled and completely cooked. Stir in all ingredients except buns. Reduce heat to 225 degrees and simmer for 15 minutes, mixing occasionally until thickened. Let me know how you enjoyed your Sloppy Joe!